Are you interested in High Court Jobs? If yes kindly give attention if you want to know the jobs you have been wanting. 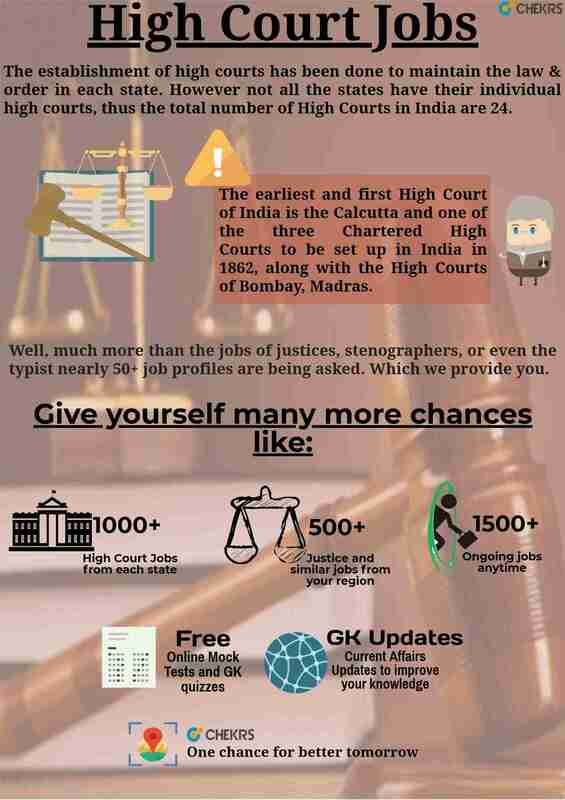 Chekrs gives you any easy solution to get High Court Vacancies 2018. We appreciate your decision to opt any job profile in high court as it offers reputation, enough money and job security coming with promotion and perks. However, firstly the candidates interested in the High Court Government Jobs should know that there are various opportunities for all other than High Court Judge Vacancy or for clerks. With Chekrs you can find out High Court Bharti which can help you get contentment. If you also want to know the High Court Upcoming Vacancy 2018 then Subscription of Chekrs is a boon for you. Here we line all of High Court Latest Vacancy from all the departments. From the varied options High Court Recruitment for Personal Assistant, Stenographer, Peon and all others you can choose one as per your educational qualification. Moreover if you are interested to know the jobs as per your province then easy filters for High Court Jobs in Chandigarh, Himachal Pradesh, Punjab, Tamil Nadu, Hyderabad, and others can be filtered as per your target. Why Chekrs for Upcoming High Court Vacancy? Besides exposing you to options, we have a vision for you to get selected. Thus you are also given the privilege to get notifications about the jobs through which High Court Recruitment 2018 can be applied easily and their preparation can be done well. Here we provide you the study material comprising of pervious papers and free online mock tests.